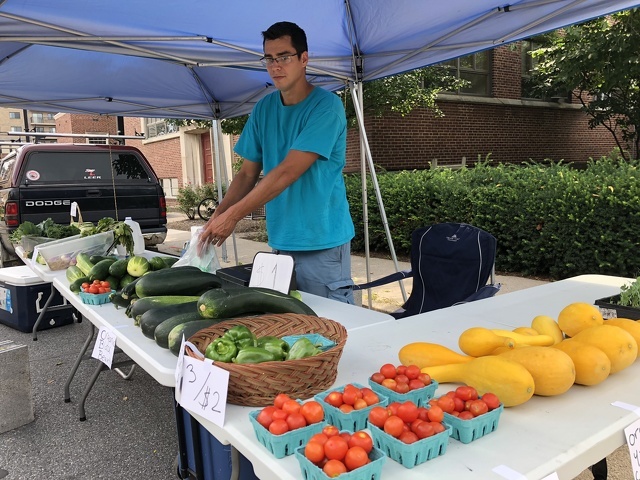 Vathan Dorbolo from Grow at Home Farms in Philipsburg is selling what he can at the Downtown State College Farmers Market. Borbolo said the heavy rains that have hit the area have devastated his crops. STATE COLLEGE — Area farmers are constantly keeping an eye on the weather. Too little rain means drought and plants that can’t grow. Too much rain can be a problem, too, and this season has seen Centre County waterlogged, with heavy rain causing flooding and overly wet conditions. It rained early and it rained often in July, and Adriana Murillo-Williams, who works with farmers through Penn State Extension, said that rain has affected area farmers such as Dorbolo in different ways. “The rain in the spring kept crops from being planted at the optimum time, and this is why there are soybeans and corn at a wide range of growth stages across the county. With the delayed planting, there are associated yield reductions for each crop,” said Murillo-Williams. “So, the delay will cause some crops to be planted later than normal and that causes the fields to produce less than normal. "But, the problems haven’t stopped there. On already-standing crops, too much rain can cause water logging, where there is more water than the soil can absorb, and flooding, water above the soil surface, and crop damage can occur. Soybeans are especially affected by the standing water in the fields that lead to nitrogen loss. She said that wheat production also has been affected by the high humidity and heavy rain, causing a fungus to occur on plants. Murillo-Williams said the amount of damage that occurs from a flood depends on when the crops were planted, with more-mature plants more likely to recover. But, the more it rains, the more stress that is caused on all plants, which will affect the yield. Barry Moser, of Moser’s Farm in Centre Hall, said the rains have been troublesome for are farmers. He said the rain is good for some crops, but for others, it has had a negative effect. He said his peppers and zucchini have done well, and he keeps many of his crops in a place that has a little insurance against the rain. But, he said most of his apples fell off the trees during the heavy rains and are ruined.